We had a bit of time before the theater and decided to look for something to eat. 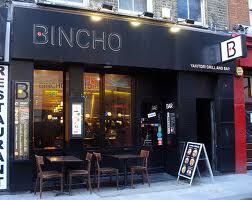 We chose to dine at an adorable Japanese restaurant named Bincho. 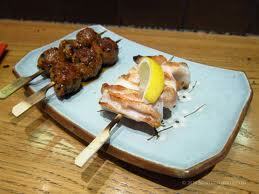 They specialize in traditional Japanese yakitori. The restaurant itself has a wonderful ambiance with clean and simple decorations and club music playing in the background that maintains a certain vibe throughout the dining experience. The restaurant space is quite long and narrow and does not have many tables in the front. Towards the back is a small and comfortable lounge area where we were seated with large couches and upholstered ottomans. Our dinner was simply prepared but full of flavor and very delicious. 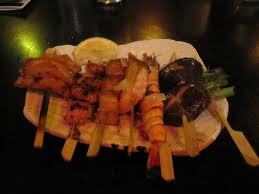 We enjoyed skewers of grilled chicken and vegetables, steak, pancetta wrapped enoki mushrooms, grilled asparagus & rice. The restaurant also has quite an extensive sake menu. The service was wonderful & the food was fresh and delicious. If you're ever in London I would highly recommend this restaurant!